Directly built on a rocky seashore in 1550, to defend the city against the continual incursions and sacks by the pirates, it has now become the symbol of Rapallo and it is used for events and exhibitions. This Shrine, one of the most important of Liguria, lies in a panoramic position at the top of the hill behind Rapallo, at an altitude of 612 meters. It was built one year later the apparition of the Holy Virgin, in 1557, but renovated during 19th century. The interiors house a large collection of votive offerings, as the Holy Virgin is the Patron of the city of Rapallo since 1739. The Romanesque Church, set in the heart of the historic centre, was the first Christian building to be erected in the area of Rapallo, at the beginning of 12th century. Together with the Bianchi Oratory, the Civic Tower and the actual Municipality building it formed the first housing unit of Medieval Rapallo. Firstly built in 1133, it was transformed at the end of 16th and during 18th centuries. It hosts important paintings, first of all the Crucifix with Saint Francis, Saint Bernardo and the noble Francesco Orero, by the famous Flemish painter Anthony Van Dyck. Known since 1206 it was firstly ruled by the Cistercian sisters and then by the Poor Clares, until 1569, when it was suppressed by the Council of Trent, so that the complex was more and more abandoned. Nowadays it is possible to visit the striking ruins, with the church apse, transept and cuspidate steeple, and part of the cloister. The Attilio and Cleofe Gaffoglio Civic Museum houses precious collections of decorative arts in gold, ivory, porcelain, sculptures and paintings dating back from the 13th century to the 20th century, which Attilio Gaffoglio collected in his home over the last forty years. 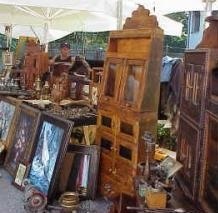 At the beginning of the year 2000 he donated about 300 articles and pieces of antique art to the Municipality of Rapallo including porcelain, majolica, silver and ivory pieces, icons and other items in various materials. At his unexpected death, some months later, the Town of Rapallo inherited the remainder of his collection, including also numerous painting from the early 1900s. The works of art are displayed according to the type of material and technique used to create them, and to the artistic groups and areas they pertain to. On the promontory covered by maritime pine trees between San Michele di Pagana and the little beach of Prelo, there is one of the few examples of “Saracen towers” not encompassed in a residence or spoiled by other uses. The Tower of Punta Pagana is a standing example of the period between the 16th and 17th centuries when the Ligurian coasts were under the threat of corsair invasions. The FAI (Italian Art and Environment National Trust) has recovered the tower and supervises the species of trees that surround it. The “bombard chamber”, the original brick floor and the 17th century exteriors have all been restored.